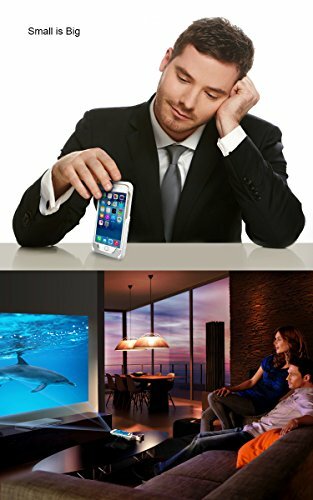 Portable Mini Video Projector for iPhone - Moar Stuff - You don't need it but you know you want it. Please note that you need to have a HDMI to lightening cable first to connect the projector and your phone. After connecting them, your phone image will mirror to the projector and show you a larger screen. Brightness: 100 ANSI Lumens, 1.07 billion color. 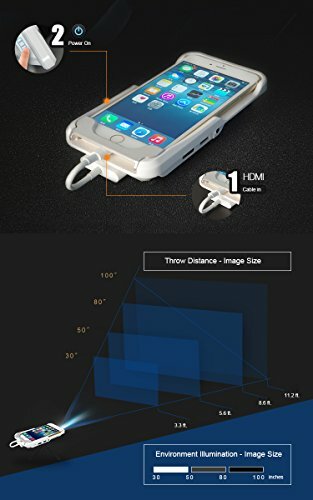 Very good for you to watch movies or other videos when you feel phone screen is too small. Image Size: 18~150 inches, 70 inches recommended Projection Distance: 0.23~3.5m RGB LED light source by OSRAM up to 20000 hours of lifetime, 80W Power. This projector could also be a power bank when in urgent cases. The build in battery is 2400mAh, not much but you will find it useful when in some urgent situations. 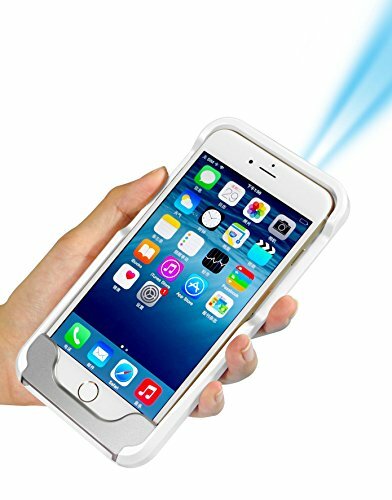 This Portable Mini Video Projector for iPhone is like a having a big screen in your pocket. 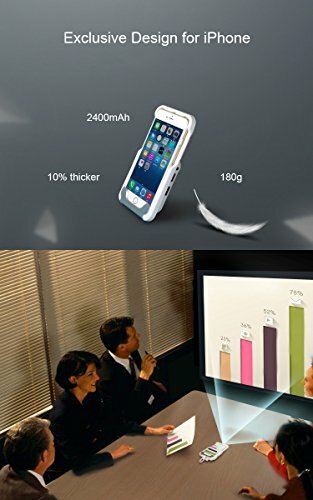 Basically, it’s an iPhone 6/7 cradle with a built in 2,400 mAh battery and a 100 lumen DLP pico projector. Most other pico projectors, like the RiF6 Cube, only offer 50 lumens so this is twice as bright. 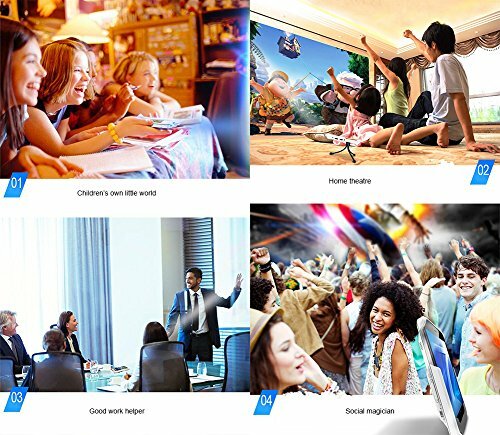 The pico projector is equipped with the latest LED projection technology and delivers clear, sharp, bright, dazzling color quality images with an operating life of over 20,000 hours. It offers 480i resolution at 854 x 480 pixels. It has a throw range of between .25 and 3.5 meters (from 12 inches out to about 12 feet) so it can be used in a small meeting room. at maximum distance, the screen size would be about 3 meters (150 inches). There’s even an additional HDMI/MHL port to connect to other devices such as laptops, DVD players, tablets, game consoles etc. 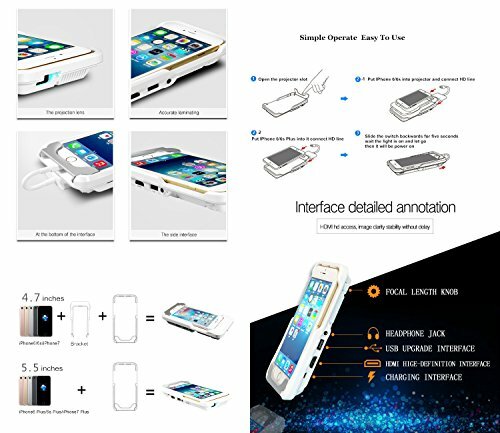 Now, the case does not have a pass-through connector so you will need to have a HDMI to lightning cable first to connect the projector and your phone. After connecting them, your phone image will mirror to the projector and show you a larger screen. Also, while it’s brighter than most pico projectors, at 100 lumens, you’ll still want to have a fairly dark room to view it. The internal battery is normally for the projector. However, if you need to, you can use it to charge your phone or other device. It even provides a standard 3.5mm audio out for speakers or headphones. It’s a great way for business people and road warriors to give presentations to small groups. 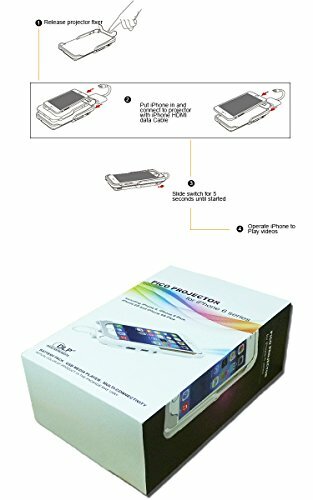 It’s also great for people who want to stream Netflix with their phone but don’t want to look at a tiny screen. Dimensions: 4.9 x 2.8 x 8.4 in. Required Accessory: Apple lightning digital AV Adapter ( NOT INCLUDED ).